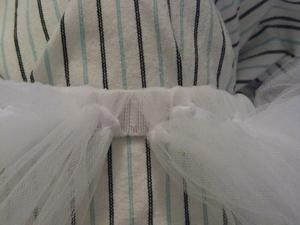 Plumtickled: Tutu Tutorial Time.... say that three times fast! Tutu Tutorial Time.... say that three times fast! 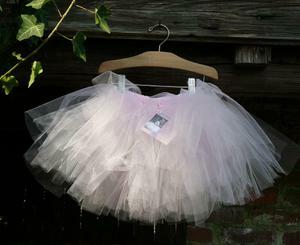 Here's the tutorial I promised on how to make a tutu for the little girly person you love. This is a no sew project that could certainly be done with your little girly person. This should only take about 30 minutes from beginning to end and makes a great last minute birthday present. Sell 'em. Just don't come crying to me when you get an order for 14 batrillion like it just did! Ack! Use more than one color per tutu if you'd like. I really love how they look when you do this! Just alternate the colors! Please note that the hands that are captured within the photos of this here tutorial are mine and not some fat old lady with age spots....... I have freckles. I do. Please note that if any "spots" see on the carpet that is also captured in this here tutorial have been contributed and donated by Spoodles McCarpet Crapper. (I rented a Rug Doctor last week and it worked wonders!). Have fun with your girl........ make one for yourself and have fun with the DAD! 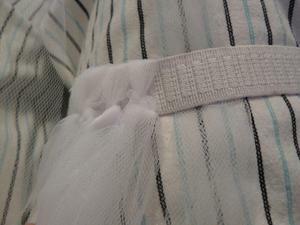 Two rolls of 6" tulle in any color or color combination you'd like. You could certainly use more if you'd like. 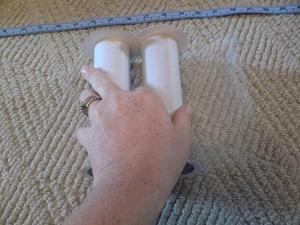 Two rolls takes care of any size up to probably a 4T-6. (I think anyhoo.) You could also have it cut from the bolt if you can't find the rolls....... it's cheaper but I soooo hate working with tulle for cutting. It's slippery and a pain sometimes. 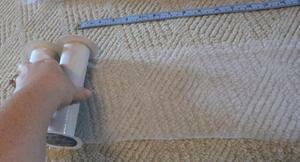 Cut it in 6" widths and then in half lengthwise...... you have less options with length but still works great. Do what you wish...... my Angel of a Husband says I whine too much...... maybe he's right. Uh, Maybe. 1" elastic........ enough to go around the girl tummy. 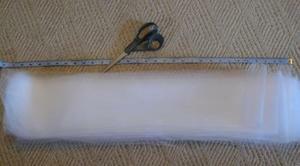 Scissors or rotary blade/cutting mat. Strawberry Crystal Light with lots of ice. Okay ...... this is how I do it. This is just a suggestion as you can figure out your way if you'd like but so far........ this is the easiest! 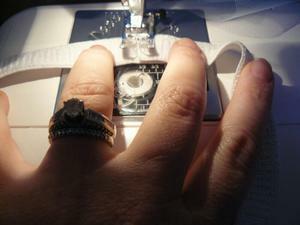 Try to aim the knot part towards the bottom so it will lay nicely. Fill it up as much as you wish or as little. This is all up to you. You're girl could sooooo do this for herself or a little friend! Here are some pictures of them in different colors! All remaining fabric in my Etsy shop is now $5.00-$6.50 per yard! Mention my blog in the comments section at checkout and I'll deduct 15% off of your total before shipping!! That. Is. GENIUS!! Oh I think I could do that! I will have to try after I get them all settled in school and potty boy is set too. I know Hannah would help me. THANKS for posting this!! Holy Cow! That is the easiest thing ever! Thanks a bunch... I have a certain princessy neice who would adore this...my little one still doesn't know the diff between girly and not...she plays with trucks and cars, but I think she might need an introduction to the tutu!!! P.S. the "big girl bed" petrifies me! Good for her and her yummy cupcake! brilliant! I had no idea the tool went length wise not width wise (does that make sense?) now if I could only find the a use for a tutu at 25 years old. hmmm. okay it will have to wait for future kids. ooooohh do you make them in chubby 22 yr old sizes? I'd love to buy one when I get some $$! Fantastic! I'm totally doing this for my nieces birthday party! Just made this for my daughter - she LOVEs it - she is such a ballerina! thanks for sharing this with us! oh i just love this! i'm going to make it for my friend because she wants me to sew her a tu tu...and i don't even have to sew this! but is there any way that i could put sequins on it? 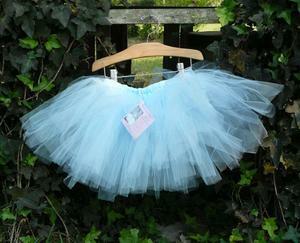 I have a niece, Eleri, who has just gotten the ballet bug and this will be a wonderful pressie for her. Thanks so much for the tutorial and instructions. I actually thought it looked really difficult until I read the instructions. Cheers. 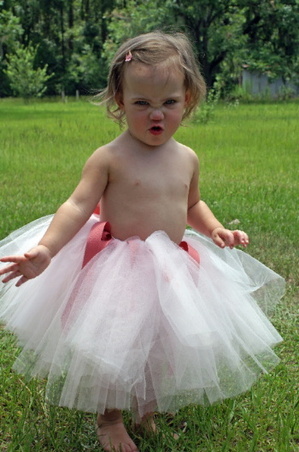 Don't you just love tutus? I made one like this for my little one for her first birthday last year. She still loves to dress up in it! This is genius! I made three of these in no time at all and they are beautiful. Thank you so much! How do you keep the elastic from rolling with each knot. I made one, but my elastic is a twisted mess under my knots. Your's looks so polished and perfect. Thanks ever so much for posting this tutorial! I just made one for my girl, there are photos on my LJ if you'd like to see. I found the most amazing rainbow tulle, and luckily I bought a couple of extra metres in case of emergency giftage. I didn't find the cutting up too onerous! Thank you for the pictures, I have made one before seeing this site and the pics would have been very helpful! Would you consider making one for a grownup, about size 16-18, in red and black, longer length? If you're interested, please e-mail me. Thanks!!! I see in the top pic, the little girl has a ribbon on her tutu- did you just sew that on? Can you give any instructions for adding that cuteness factor? Wow.. this helps ALOT. I wanted a tutu for Otakon. This is PERFECT. Thanks!!! Hey there. LOVED the tute. A friend sent it to me, and I had to add you to my Reader. You're hilarious! I would really love to start selling these and have started making them. They're beautiful. How did you manage to get a billion orders?? Any tips for someone starting out? along with a matching headband I improvised. this is the most simple tutorial i have come across yet and i love it! my friend and i just finished making some for ourselves and i cant wait until my boyfriends niece get old enough for me to make her one, thank you so much for posting this! I made one of these last night. It came out so cute. I posted a picture on my blog and linked to your tutorial. Love this project! My sister is having a little girl at the end of the month, and I can't wait to make her an Easter tutu! fabulous! 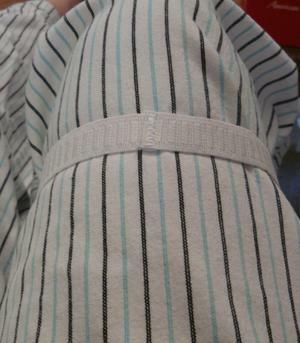 I had a pattern to sew one...what a pain. I'm doing this for my little fancy girl, tomorrow!! Thank you! !